On Friday Night February 9th, 2018 Ring of Honor presented “Honor Reigns Supreme” from the Carrabus Arena in Concord, North Carolina. The event was streamed live on ROHWrestling.com, Ring of Honor’s Facebook page, and The Fite App. ROH offered the event for free as part of the company’s test for their infrastructure of the upcoming HonorClub streaming service. I was in attendance for last night’s event, so I apologize for the delayed coverage and recap of the event. The internet signal was horrible in the venue last night on my phone, I wasn’t able to tweet any coverage or images to you guys, so I tried to take as detailed notes as I could for the write up today. All photographs used in this article were taken by us here at BodySlam.net. 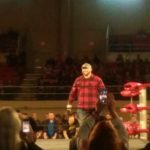 The show opened with Bully Ray, coming out to the ring to a huge chant of “Hall of Fame” from the Concord crowd. Bully tells us in attendance that he thanks us in attendance but says that tonight is about ROH. Bully warms up the crowd mentioning their expanse to multiple platforms, mentions North Carolina for a nice cheap pop. He continues by saying that they are going to show why ROH is the best professional wrestling company on the planet, and that Honor will reign supreme. Bully then leads an ROH chant. Punishment Martinez vs. Flip Gordon. This match was a good match showcasing the speed of Flip Gordon and the power of Punishment Martinez. Lots of nice spots in the match from both men. Early on Gordon hits Martinez with an enziguiri sending him to the floor. Gordon followed it up with a nice diving kick through the ropes. Once the match got back into the ring Gordon tries to capitalize using his speed and agility but Martinez caught him and ends up knocking him off the ring apron sending him crashing into the barricade surrounding the ring. Martinez follows that up with a hip toss on Gordon into the barricade again. Later in the match Punishment Martinez attempts a senton, but misses as Flip rolls out of the way. This gives Flip the advantage as he connects with a forearm, and some right hands but eventually is dropped by a huge shot from Punishment Martinez. Momentum shifts again in the match. Gordon showing of his athleticism. Flip connects with a springboard off the ropes into a slingblade. Crowd likes it. Flip up to the top rope, he goes for a dive but Martinez moves out of the way. Flip with the advantage again, catches Martinez with a move I honestly don’t know the name of. He follows that up with a running shooting star press, he goes for the cover. Only a two count. Punishment now fights back and is in control of the match, he scoops Flip up puts him into the Torture Rack. Flip slips out and connects with a superkick on Martinez. Crowd likes that too! Flip back in control of the match, but is nailed with a huge clothesline from Punishment Martinez that turns Gordon inside out. Flip tries for something off the aprun, goes for the springboard but is caught by Martinez with a chokeslam off the ropes, flip evades. Flip now his another springboard into a hurricanrana off the top! Crowds hot, they’re behind Flip here. Gordon goes back up top, he flys off the turnbuckle and connects with a 450 splash on Martinez. Flip goes for the pin, but Martinez kicks out just before the three. Two count only. Punishment back up, he grabs Gordon by the throat, he goes for the chokeslam again, but again Flip evades and connects with a kick followed by a knee on Martinez. Flip is feeling it, he goes for his finisher, the star spangled stunner.. Martinez catches him though! Punishment slams Gordon to the mat, follows it up off the ropes with a curb stomp to Flip. Punishment picks him up, here it comes, Martinez with the big sitout chokeslam, and gets the pinfall. My Take: Pretty good opening match. Fun spots all around. Kinda sloppy and loose at times, but overall a solid match from the two. Some jawing back and forth to start off. Kenny King doing his cocky showboating schtick to start off trying to get the psychological advantage over Shane Taylor early on. Taylor isn’t too fond of King’s arrogance. Taylor in control of the match now, but King catches him with a sunset flip out of the corner. Taylor goes to the outside to regroup. Kenny King doesn’t allow it however, as he leaps over the ropes with a twisting pescado to the floor onto Taylor, but Taylor sees it coming and moves out of the way. King lands on his feet however, somehow. The two trade blows on the outside, King gets the advantage. King back inside. Taylor still out on the floor. Here comes King again with a high risk maneuver connecting this time on Taylor with a twisting senton. King celebrates on the outside, yelling “who has a phone? !” Then posing for a selfie with the first fan who had their phone ready. Match moves back into the ring finally as Taylor is tossed in, King connects with a nice flying body press back into the ring. King attempts to irish whip Taylor into the corner, but he is caught off the rebound and Taylor hits a HUGE chokeslam on King. Taylor goes for the cover, kick out and a near fall. Taylor with control of the match. King fights back, he avoids Taylor charging into the corner, he leaps but is caught with a back elbow, and followed up quickly with a big splash off the ropes. Taylor goes for the pin, and only a two count. Taylor once again in control of the match. Wearing King down with a rear chinlock. King tries to fight out, but is caught with a spinning heel kick, heres a cover, and only a one count that time. Haha, some fans around me around heckling and yelling about no selling the cover, and other various one count related taunts. Match moves to the ring apron. King connects with a cartwheel kick move thing on Taylor, sending him crashing down to the floor. King tries again for the spinning pescado from the ring to the outside, he hits it this time. Crowd pops hard for the spot. Taylor back inside the ring now, Kenny King on the outside waiting and nails a nice springboard blockbuster. King goes for the cover, and Taylor kicks out at two. King tries to pick Taylor up on his shoulder, but Taylor is just too big. Taylor follows up with a monster clothesline on King. Taylor with a quick cover, only a two count on King. Taylor with the advantage again, and picks King up and nails him with a huge sitout powerbomb into a pinfall. King again kicks out at two. King is down as Taylor goes up top. King catches him on the turnbuckle with a European Uppercut. King goes for a superplex but is throw off by Taylor. King lands on his feet. King jumps up and connects with a kick to the side of Taylor’s head. Taylor is dazed, King uses the opportunity to scoop Taylor off the turnbuckle onto his shoulders, King hits the Royal Flush on Taylor. King covers, and gets the three count! King and Taylor show each other respect after the match and embraced as Taylor recovered on the ring apron. My Take: Good match here. Taylor moves well for a big man, and Kenny King always likes to show off his agility and athleticism. The match told a good story, and helps push King forward in his hunt for the ROH TV Title held by Silas Young. Ian Riccaboni comes out onto the entrance stage. He announces the 16th competitor for the Women of Honor championship tournament… music hits, and out comes Former WWE Superstar Emma, Tenille Dashwood. Everyone in the building went nuts. Huge pop for Dashwood. Tenille said that response felt good. She says that she was here at ROH to enter the tournament and become the first-ever Women of Honor champion. Ian Riccaboni mentions the international talents involved in the tournament. Out comes Bully Ray. He says that all those names are great, and that the tournament is going to be great. Bully continues by saying that everyone here wants to see her compete tonight. He said that if you are going to make your mark in ROH, you won’t have a better place to do it then doing it tonight. My Take: Huge surprise for us in the crowd. Everyone was freaking out, really a cool moment. Solid wrestling going on here in this match. Lots of nice back and forth sequences. Lots of amateur wrestling takedowns and moves from Woods. Some nice bad guy tactics by Silas Young, he pokes Woods in the eyes with two fingers at one point. Young has the advantage for awhile, but eventually Woods begins to make a comeback. This comes to an abrupt halt however when The Beer City Bruiser, who accompanied Young at ringside, clocks Woods with a beer can while he was hanging through the ropes. Young stayed in control of the match until he was caught with a heel hook into a submission hold by Woods. The Beer City Bruiser didn’t like the look of this, so he rushes around the ring and pulls Silas to the ropes causing the referee to break the hold. Woods began to make a comeback as he catches Silas coming out of the corner with The Chaos Theory, and then goes for an armbar on Young. Woods transitions out of the hold and goes back into an ankle lock. Silas using some crafty veteran tactics here and uses his own weight to roll Woods’ shoulders to the mat, scoring a close two count. Woods back up, but Silas is waiting he catches Woods with a knee and follows it up with Misery. Silas goes for the cover, and gets the pin. After the match, Kenny King comes out to the top of the entrance stage. King jaws with Silas who is still in the ring, building more towards their upcoming TV Title rematch. My Take: Good match here. Silas Young is so solid and smooth in the ring. Good crowd interaction from the outside by The Beer City Bruiser. I really don’t understand why Silas isn’t more over with the ROH fans.